Things have been slow around the Suburban Farm, but finally, there’s progress. On a comp. day, I managed to plant the entire farm: carrots, peppers, broccoli, onions, corn, beans and lettuce. The lettuce, generously donated by a coworker, is growing in containers in the back of the house. Cucumbers, tomatoes, pumpkins and watermelons will be along shortly. This is the second year I’ve had this plot, and what’s so fantastic about the second time around is that it doesn’t take as much work to prepare the soil. No tilling, just a hearty does of digging and turning. Last year I mulched heavily with grass clippings donated by my neighbors. It’s like having a self-contained compost heap. As I turned the soil this year, not only did I notice how quickly my shovel sank into the earth, but I saw more worms, a sure sign of soil health. Again, I’ve put out the call for grass clippings. It’s risky business, but something I think is worth it. Who knows what you’ll get, and there’s rarely a chance you’ll get anything chemical-free. However, I think the risk is worth it; there are too many benefits to using grass, or any other organic matter–to mulch your garden. 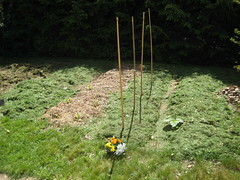 For the five days the farm went without grass clipping mulch, I fretted about the seeds drying out, and crab grass taking over. There seems to be two donors of grass clippings: the person with the rancid bags of moldy grass, and the guy with the amazing, succulent, emerald grass. The former bags their clippings, ties off the ends, and leaves them sitting around. When I open the bags I’m greeted by a rancid odor of wet, clumpy grass, matted and moldy. It’s really gross. But what am I going to do, add an addendum to the sign? Instead, I fork it across the ground, fluffing and fighting the matted moldy areas. The smell of yesterday’s donation is abating; it’s turned from rancid to a pleasant farm odor. In a day or two I expect it to be odorless. I could spend my days rolling in the clippings given by the second donor, and I wasted no time scooping the sweet grass into my arms and sprinkling it about the rows. I mulched heavily around the established plants, and sifted lightly over the soon-to-emerge seeds. I don’t know if the seeds have the power to blast through three inches of mulch, so why chance it? 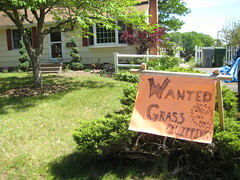 If I see that man again, the one with the amazing grass, I’m hoping to strike a deal: leave me your clippings. All of them, every week. I’ll take down the sign, and I’ll give you some vegetables. I just can’t get enough of that sweet, perfect grass.